In the application and development of pneumatic techniques, Matrix products represent the most advanced and the most innovative choice. Matrix technology allows the use of the most modern techniques of pressure and flow rate control. Matrix may offer a wide range of solutions: from the traditional to the most sophisticated ones, such as PWM (Pulse Width Modulation), PFM (Pulse Frequency Modulation), PNM (Pulse Number Modulation) and PCM (Pulse Code Modulation). The process of evolution is being determined by advanced technology, in which Matrix solenoid valves and pneumatic systems play a leading part. 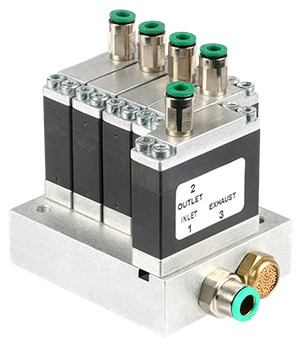 Based on digital logic and featuring both high operative flexibility and extremely fast switch speeds, Matrix solenoid valves offer surprising operating possibilities which will revolutionise pneumatic systems. Pressure and flow rate regulators, digital logic proportional solenoid valves, and integrated system control modules best represent the high level of innovation offered by Matrix technology in the pneumatic field. the pneumatics of the future is available today.